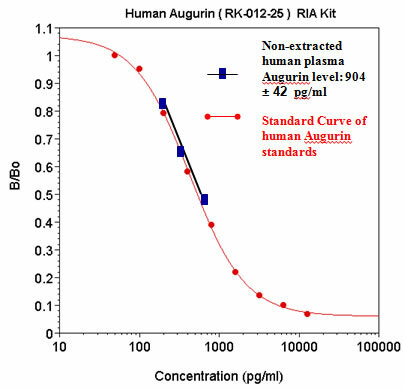 Augurin - Research Abstracts, Antibody Stainings, Kits Standard Curves, Sequences, etc. (B) Candidate proteins generated from Ecrg4 gene expression. Eight potential protein products are predicted by algorithms to be generated from the single gene: intact Ecrg4(1-148); its leader sequence, augurin, argilin and ecilin and their δ-16C-terminal cleaved homologs: C-δ-16-augurin, C-δ-16-argilin and the δ-16 peptide itself. Cell surface localization and release of the candidate tumor suppressor Ecrg4 from polymorphonuclear cells and monocytes activate macrophages. Baird A, et al., J Leukoc Biol. 2012 Mar 6. We identified fresh human leukocytes as an abundant source of the candidate epithelial tumor suppressor gene, Ecrg4, an epigenetically regulated gene, which unlike other tumor suppressor genes, encodes an orphan-secreted, ligand-like protein. In human cell lines, Ecrg4 gene expression was low, Ecrg4 protein undetectable, and Ecrg4 promoter hypermethylation high (45-90%) and reversible by the methylation inhibitor 5-AzaC. In contrast, Ecrg4 gene expression in fresh, normal human PBMCs and PMNs was 600-800 times higher than in cultured cell lines, methylation of the Ecrg4 promoter was low (<3%), and protein levels were readily detectable in lysates and on the cell surface. Flow cytometry, immunofluorescent staining, and cell surface biotinylation established that full-length, 14-kDa Ecrg4 was localized on PMN and monocyte cell surfaces, establishing that Ecrg4 is a membrane-anchored protein. LPS treatment induced processing and release of Ecrg4, as detected by flow and immunoblotting, whereas an effect of fMLF treatment on Ecrg4 on the PMN cell surface was detected on the polarized R2 subpopulation of cells. This loss of cell surface Ecrg4 was associated with the detection of intact and processed Ecrg4 in the conditioned media of fresh leukocytes and was shown to be associated with the inflammatory response that follows severe, cutaneous burn injury. Furthermore, incubation of macrophages with a soluble Ecrg4-derived peptide increased the P-p65, suggesting that processing of an intact sentinel Ecrg4 on quiescent circulating leukocytes leads to processing from the cell surface following injury and macrophage activation. Processing of proaugurin is required to suppress proliferation of tumor cell lines. Augurin is a secretory molecule produced in pituitary, thyroid, and esophagus and implicated in a wide array of physiological processes, from ACTH release to tumor suppression. However, the specific proaugurin-derived peptides present in various cell types are not yet known. In order to shed light on the posttranslational modifications required for biological activity, we here describe the posttranslational processing of proaugurin in AtT-20 and Lovo cells and identify proaugurin-derived products generated by convertases. 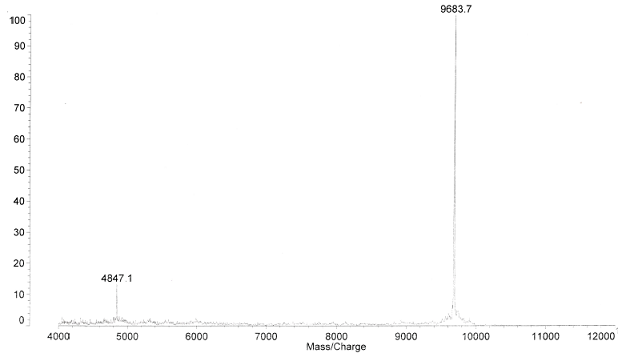 In vitro cleavage of proaugurin with proprotein convertases produced multiple peptides, including a major product with a mass of 9.7 kDa by mass spectrometry. Metabolic labeling of C-terminally tagged proaugurin in AtT-20 and AtT-20/PC2 cells resulted in a major 15-kDa tagged form on SDS-PAGE, which likely corresponds to the 9.7-kDa in vitro fragment, with the added tag, its linker, and posttranslational modification(s). The secretion of neither proaugurin nor this cleavage product was stimulated by forskolin, indicating its lack of storage in regulated secretory granules and lack of cleavage by PC2. Incubation of cells with the furin inhibitor nona-d-arginine resulted in impaired cleavage of proaugurin, whereas metalloprotease inhibitors did not affect proaugurin proteolysis. These data support the idea that proaugurin is cleaved by furin and secreted via the constitutive secretory pathway. Interestingly, proaugurin was sulfated during trafficking; sulfation was completely inhibited by brefeldin A. Proliferation assays with three different tumor cell lines demonstrated that only furin-cleaved proaugurin could suppress cell proliferation, suggesting that proteolytic cleavage is a posttranslational requirement for proaugurin to suppress cell proliferation. Gonzalez et al. Fluids Barriers CNS. 2011 Jan 18;8(1):6. BACKGROUND: The content and composition of cerebrospinal fluid (CSF) is determined in large part by the choroid plexus (CP) and specifically, a specialized epithelial cell (CPe) layer that responds to, synthesizes, and transports peptide hormones into and out of CSF. Together with ventricular ependymal cells, these CPe relay homeostatic signals throughout the central nervous system (CNS) and regulate CSF hydrodynamics. One new candidate signal is augurin, a newly recognized 14 kDa protein that is encoded by esophageal cancer related gene-4 (Ecrg4), a putative tumor suppressor gene whose presence and function in normal tissues remains unexplored and enigmatic. The aim of this study was to explore whether Ecrg4 and its product augurin, can be implicated in CNS development and the response to CNS injury. METHODS: Ecrg4 gene expression in CNS and peripheral tissues was studied by in situ hybridization and quantitative RT-PCR. 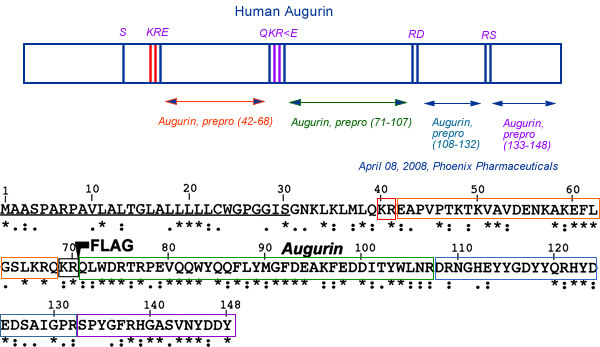 Augurin, the protein encoded by Ecrg4, was detected by immunoblotting, immunohistochemistry and ELISA. 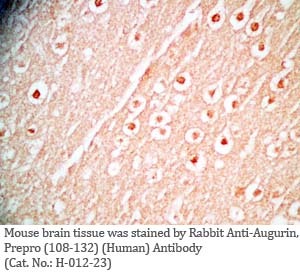 The biological consequence of augurin over-expression was studied in a cortical stab model of rat CNS injury by intra-cerebro-ventricular injection of an adenovirus vector containing the Ecrg4 cDNA. The biological consequences of reduced augurin expression were evaluated by characterizing the CNS phenotype caused by Ecrg4 gene knockdown in developing zebrafish embryos. RESULTS: Gene expression and immunohistochemical analyses revealed that, the CP is a major source of Ecrg4 in the CNS and that Ecrg4 mRNA is predominantly localized to choroid plexus epithelial (CPe), ventricular and central canal cells of the spinal cord. 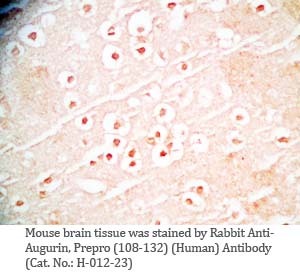 After a stab injury into the brain however, both augurin staining and Ecrg4 gene expression decreased precipitously. If the loss of augurin was circumvented by over-expressing Ecrg4 in vivo, BrdU incorporation by cells in the subependymal zone decreased. Inversely, gene knockdown of Ecrg4 in developing zebrafish embryos caused increased proliferation of GFAP-positive cells and induced a dose-dependent hydrocephalus-like phenotype that could be rescued by co-injection of antisense morpholinos with Ecrg4 mRNA. CONCLUSION: An unusually elevated expression of the Ecrg4 gene in the CP implies that its product, augurin, plays a role in CP-CSF-CNS function. The results are all consistent with a model whereby an injury-induced decrease in augurin dysinhibits target cells at the ependymal-subependymal interface. We speculate that the ability of CP and ependymal epithelium to alter the progenitor cell response to CNS injury may be mediated, in part by Ecrg4. If so, the canonic control of its promoter by DNA methylation may implicate epigenetic mechanisms in neuroprogenitor fate and function in the CNS. Ozawa A et. Al. Mol Endocrinol. 2011 May;25(5):776-84. Epub 2011 Mar 24. Each predicted mass was calculated using ProteinProspector. N.D. indicates not detected. The His tag-R41 fragment consists of the Histag-linker region and augurin (N32-R41) with calculated masses of 3257 and 1271 Da, respectively; after the subtraction of 18 Da due to the formation of peptide bond between the 3257- and 1271-Da fragments, the total predicted mass of the His tag-R41 fragment is therefore 4510 Da. 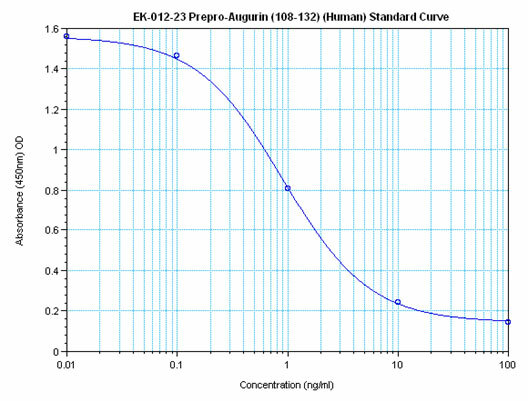 Augurin stimulates the hypothalamo-pituitary-adrenal axis via the release of corticotrophin-releasing factor in rats. Tadross et al. Br J Pharmacol. 2010 Apr;159(8):1663-71. Epub 2010 Mar 8. BACKGROUND AND PURPOSE: The functional characterization of secreted peptides can provide the basis for the development of novel therapeutic agents. Augurin is a recently identified secreted peptide of unknown function expressed in multiple endocrine tissues, and in regions of the brain including the hypothalamus. We therefore investigated the effect of hypothalamic injection of augurin on the hypothalamo-pituitary-adrenal (HPA) axis in male Wistar rats. EXPERIMENTAL APPROACH: Augurin was given as a single injection into the third cerebral ventricle (i.c.v.) or into the paraventricular nucleus (iPVN) of the hypothalamus. Circulating hormone levels were then measured by radioimmunoassay. The effect of augurin on the release of hypothalamic neuropeptides was investigated ex vivo using hypothalamic explants. The acute effects of iPVN augurin on behaviour were also assessed. KEY RESULTS: i.c.v. 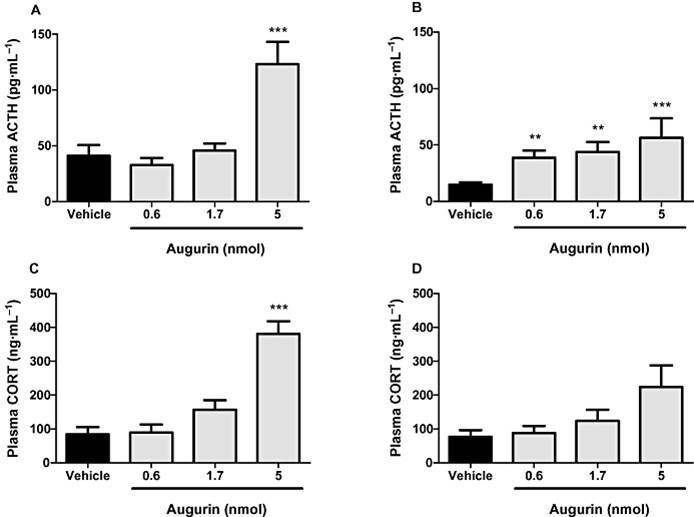 injection of augurin significantly increased plasma ACTH and corticosterone, compared with vehicle-injected controls, but had no effect on other hypothalamo-pituitary axes hormones. Microinjection of lower doses of augurin into the PVN caused a similar increase in plasma ACTH and corticosterone, without significant alteration in behavioural patterns. Incubation of hypothalamic explants with increasing doses of augurin significantly elevated corticotrophin-releasing factor (CRF) and arginine vasopressin release. In vivo, peripheral injection of a CRF(1/2) receptor antagonist prevented the rise in ACTH and corticosterone caused by i.c.v. augurin injection. CONCLUSIONS AND IMPLICATIONS: These data suggest that augurin stimulates the release of ACTH via the release of hypothalamic CRF. Pharmacological manipulation of the augurin system may therefore be a novel target for regulation of the HPA axis. The bioactive peptide, E42-R70, has been synthesized as Phoenix´s catalog numbers 012-19 (human) and 012-20 (mouse). Effect of a single i.c.v. injection of augurin (0.6, 1.7 or 5 nmol) or vehicle in ad libitum fed male Wistar rats on plasma ACTH and corticosterone (CORT) at 20 (A and C) and 60 (B and D) min post injection. **P < 0.01, ***P < 0.001 versus vehicle, n= 8-10 per group per time point. Results are mean ± SEM. 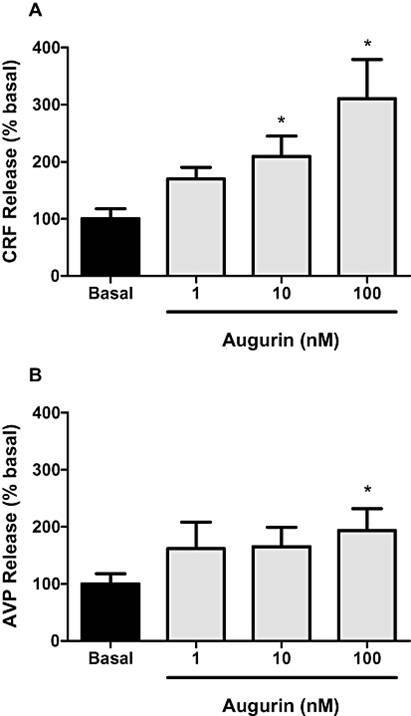 Effect of augurin (1, 10 or 100 nM) on corticotrophin-releasing factor (CRF) (A) and arginine vasopressin (AVP) (B) release from hypothalamic explants. Data presented as percent of basal release. *P < 0.05 versus basal release, n= 13-15 hypothalami per group. Results are mean ± SEM. Effect of a single i.c.v. 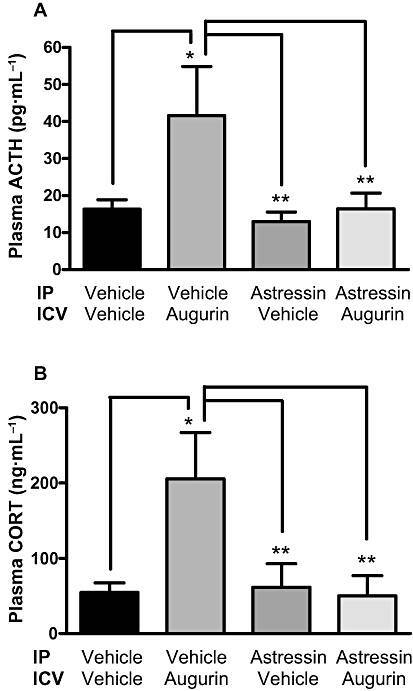 injection of augurin (5 nmol) or vehicle in ad libitum fed male Wistar rats pretreated with 100 nmol/kg astressin on plasma ACTH (A) and corticosterone (CORT; B) 30 min post i.c.v. injection. *P < 0.05, * * P < 0.01 versus vehicle, n=7-9 per group. Results are mean ± SEM. Tadross J.A. et al. Br J Pharmacol. 2010 Apr;159(8):1663-71. The choroid plexus and ependyma are major sites of Ecrg4 expression. A: Ecrg4 gene expression in the mouse embryo. B: Ecrg4 gene expression in the developing mouse brain. Higher magnification analysis of the CNS localization (from samples shown in A), shows the in situ hybridization signal localizing primarily to choroid plexus and ependyma. C: Ecrg4 gene expression in the adult mouse brain. D: Ecrg4 gene expression in the mouse choroid plexus and ependyma. A higher magnification analysis of the CNS localization (from samples shown in Panel C), show that the in situ hybridization signal localizes primarily to choroid plexus epithelial cells and to a lesser extent ventricular ependymal cells. E: Ecrg4 gene expression in mouse central canal ependymal/epithelial cells in the spinal cord. Significantly more data on the distribution of Ecrg4 gene expression throughout the mouse spinal cord, including other cell types. F: Quantitative gene expression by RT-qPCR. After extracting tissues from donor adult mice (n = 12), highest Ecrg4 expression was found in the dissected choroid plexus. Augurin immunoreactivity and Ecrg4 gene expression decreases in the CP following CNS injury. A and B: Augurin immunoreactivity decreased in rat choroid plexus after penetrating CNS injury. A: Augurin immunoreactivity in the brains of control rats was, as anticipated, readily detectable in the cytoplasm of CPe cells. In certain areas, this staining appeared apical. B: There was an apparent decrease in augurin at 1 day post injury (d.p.i.). Augurin: red, DAPI: blue, scale bar = 20 µm. 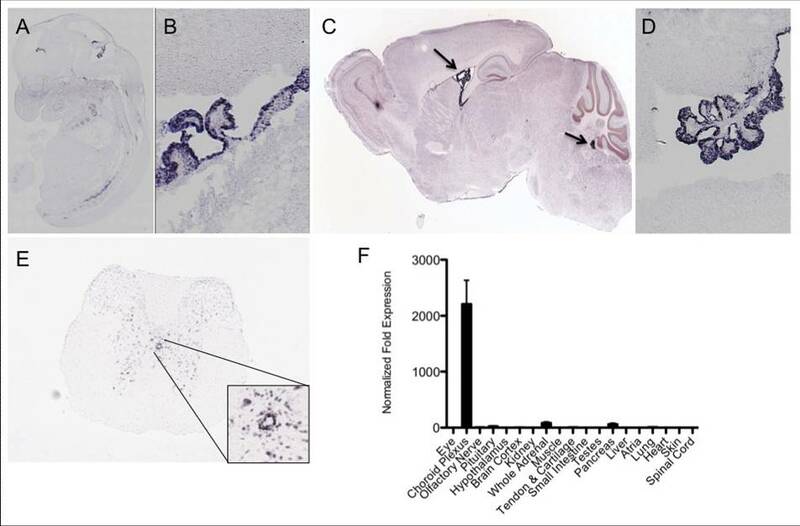 C and D: Ecrg4 gene expression decreased in rat choroid plexus after penetrating CNS injury. C: Ecrg4 gene expression in the brains of control rats was, as anticipated, readily detectable by in situ hybridization in the cytoplasm of CP epithelial cells. 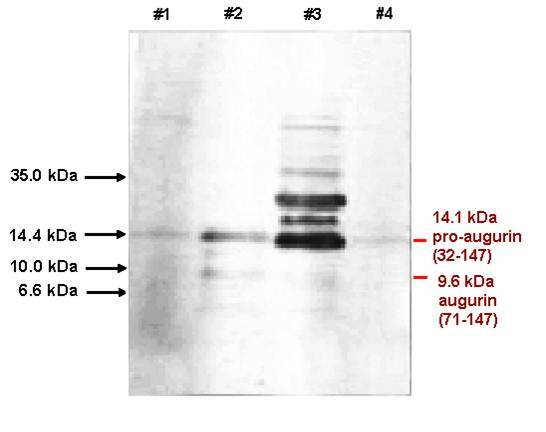 D: As shown in Panel D however, there was an apparent decrease in Ecrg4 gene expression staining in the CP-containing sections processed from animals 24 h post injury (d.p.i.). Scale bar = 20 µm. Ecrg4 over-expression inhibits injury-induced proliferation of subependymal progenitor cells. A: Transduction of ependyma with adenovirus vector containing the green fluorescent protein gene (AdGFP). If AdGFP was injected i.c.v. such that target cells were labeled prior to the penetrating injury, ependymal cells throughout the ventricles were transduced as indicated by the GFP staining of ependyma (green). Scale bar = 100 µm. B: Cell proliferation after penetrating injury after AdGFP. To monitor cell growth after injury, animals that had been injected with AdGFP, received daily injections of BrdU i.p. as described in the text and the incorporation of BrdU into DNA was evaluated by immunohistochemistry. Brdu: red, DAPI: blue, scale bar = 20 µm. C: Cell proliferation after penetrating injury and AdEcrg4. If instead of AdGFP as above, the target ependymal cells were transduced by i.c.v. injection of adenovirus containing Ecrg4 (AdEcrg4), there was a decrease in BrdU-labeled cells in the subependymal zone. Scale bar = 20 µm. 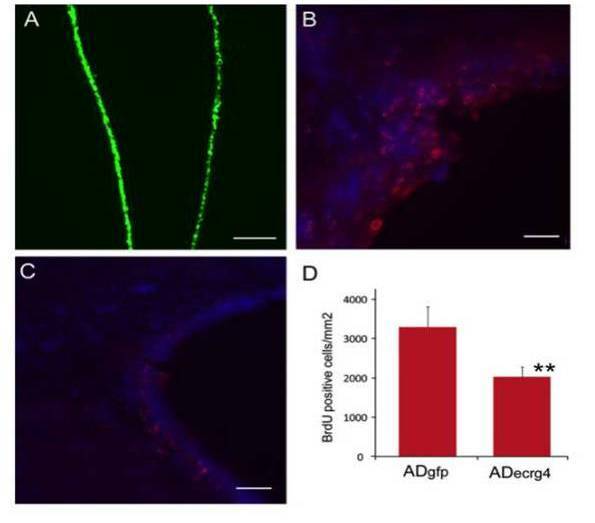 D: Quantification of cell proliferation after penetrating injury after AdGFP or AdEcrg4. When apparent differences in proliferating cell number were quantified, a significant difference in proliferating cell number was observed (p < 0.01). Error bars represent mean ± standard deviation (n = 4). ECRG4 gene knockdown causes enlarged hindbrain ventricles and a hyper proliferative response in the developing zebrafish. A: Development of Zebrafish after morpholino injection 48 hours post fertilization. In control (A1) and Ecrg4 (A2) morpholino treatments, the head, eyes, heart, yolk and hind ventricle (arrows) were photographed for analysis. The anti-sense Ecrg4a morpholino caused readily detectable hindbrain ventriculomegaly resembling a hydrocephalus-edema-like response in the CNS. The ventricles can be isolated from images for analyses (n = 8). B: Quantification of developmental effects of morpholino injection. Hindbrain ventricle size was quantified by pixel area of microscope images from n = 8 control (MO ctl), n = 8 Ecrg4a MO-treated embryos or (n = 8) Ecrg4a MO co-injected with the Zebrafish mRNA ortholog A to neutralize specific inhibition (error bars: mean ± SEM). C-E: Cell growth in Zebrafish 24 hours after control or Ecrg4a morpholino injection 24 hours post fertilization. Proliferating cells in control MO (top panels) from sagittal (C1), dorsal (D1) or after cross sections at dashed line (E1) can be compared to similar sections of Ecrg4a MO (bottom panel) injected animals by staining for phosphorylated Histone 3 (H3P, green), a marker of cell growth. H3P-positive proliferating cells are compared to that of cytoplasmic glial fibrillary acidic protein (red). The arrow (D2) highlights space corresponding to enlarged ventricles in MO-Ecrg4 treated embryos. The H3P positive cells are on the ventricle surface and there are more H3P cells and thicker GFAP staining in Ecrg4a MO. Scale bar is 100 µm F Quantification of cell growth in Zebrafish after control or Ecrg4a morpholino injection. The amount of H3P-postive cell staining was determined as described in the text and compared between treatment groups (n = 7, mean ± SEM). There were significantly more labeled cells in the Ecrg4a morpholino group. Scale bar is 100 µm. Mirabeau et al. Genome Res. 2007 Mar;17(3):320-7. Epub 2007 Feb 6. Peptide hormones are small, processed, and secreted peptides that signal via membrane receptors and play critical roles in normal and pathological physiology. The search for novel peptide hormones has been hampered by their small size, low or restricted expression, and lack of sequence similarity. To overcome these difficulties, we developed a bioinformatics search tool based on the hidden Markov model formalism that uses several peptide hormone sequence features to estimate the likelihood that a protein contains a processed and secreted peptide of this class. Application of this tool to an alignment of mammalian proteomes ranked 90% of known peptide hormones among the top 300 proteins. An analysis of the top scoring hypothetical and poorly annotated human proteins identified two novel candidate peptide hormones. Biochemical analysis of the two candidates, which we called spexin and augurin, showed that both were localized to secretory granules in a transfected pancreatic cell line and were recovered from the cell supernatant. 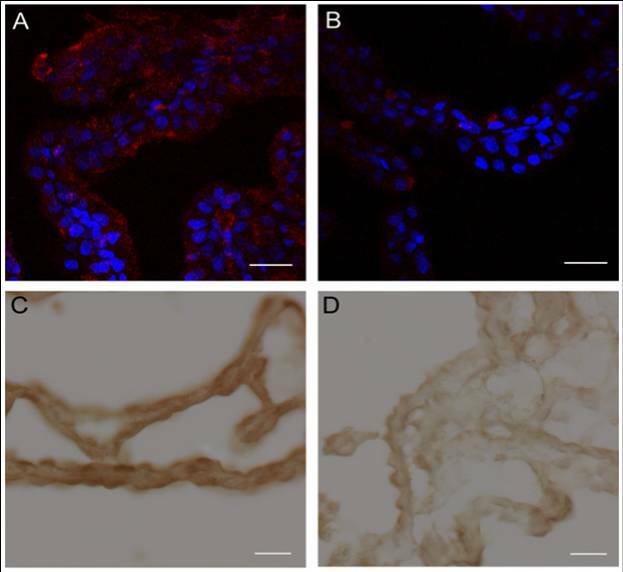 Spexin was expressed in the submucosal layer of the mouse esophagus and stomach, and a predicted peptide from the spexin precursor induced muscle contraction in a rat stomach explant assay. Augurin was specifically expressed in mouse endocrine tissues, including pituitary and adrenal gland, choroid plexus, and the atrio-ventricular node of the heart. Our findings demonstrate the utility of a bioinformatics approach to identify novel biologically active peptides. Peptide hormones and their receptors are important diagnostic and therapeutic targets, and our results suggest that spexin and augurin are novel peptide hormones likely to be involved in physiological homeostasis. Colocalization of Spexin and Augurin with Insulin in endocrine cells. Flag-tagged NPK, Spexin, and Augurin were transfected into rat pancreatic cells and fixed cells subjected to double immunofluorescence with Flag and Insulin antibodies. (A) Neuropeptide K, (B) Spexin, and (C) Augurin show colocalization with Insulin in small, cytoplasmic punctate structures. In all cases the majority of Flag immunoreactive puncta are also positive for Insulin. Identification of spexin and augurin in cell supernatants. Vector control and Flag-tagged NPK, Spexin, and Augurin were transfected into rat pancreatic cells in culture, and cell supernatants were harvested and submitted to immunoblotting with a Flag antibody. (A) Supernatants from Flag-NPK and N-Flag-spexin transfected cells contained high (solid arrow) and low (open arrow) mobility bands that reflected processing of Flag-tagged products from these constructs. (B) Supernatant from N-Flag-Δspexin transfected cells contained a 4-kDa band, suggesting that the 6-kDa product seen for N-Flag-spexin was the result of cleavage significantly C-terminal to the spexin peptide. (C) Supernatant from C-Flag-spexin contained two bands (12 and 8 kDa), confirming C-terminal cleavage of spexin pro-peptide. A 12-kDa product is seen for both N-Flag and C-Flag Spexin (open arrow), while a 13-kDa product is seen only in N-Flag-Spexin and corresponds to incompletely N-terminally processed Spexin (closed arrow). 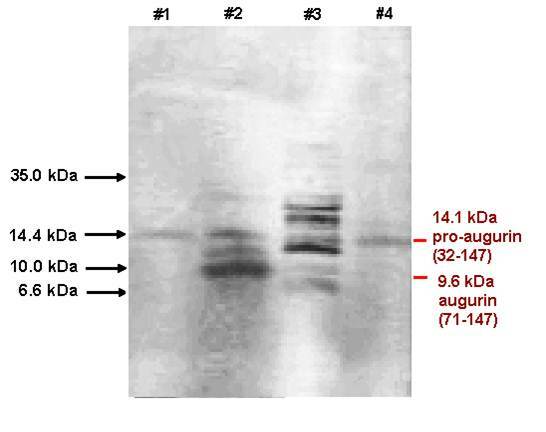 (D) The presence of two bands (10 and 8 kDa, solid arrows) in supernatant from Flag-Augurin transfected cells probed with M1 Flag antibody demonstrated cleavage of augurin at the putative pro-hormone cleavage site as well as close to the C terminus of the pro-peptide. The same immunoblot probed with M2 Flag antibody revealed an additional low-mobility product, confirming cleavage at the predicted dibasic cleavage site immediately adjacent to the Flag tag (open arrow). The major band in the porcine pancreas is 14.2 kDa augurin, but the bovine hypothalamus and pituitary show augurin derived peptides with the size at 14.1, 9.6 kDa and 6.5 kDa which can be detected by anti-augurin (71-107) antibody. The major band in the porcine pancreas is 14.2 kDa augurin, but the bovine hypothalamus and pituitary show augurin derived peptides with the size at 14.1, 9.6 kDa and 6.5 kDa which can be detected by anti-augurin (133-148) antibody.